This picture was inspired by the story of Don Quixote, a knight and his companion Sancho Panza who ride around the Spanish countryside. There are many different faces hidden in the image, some more obvious than others. 16. 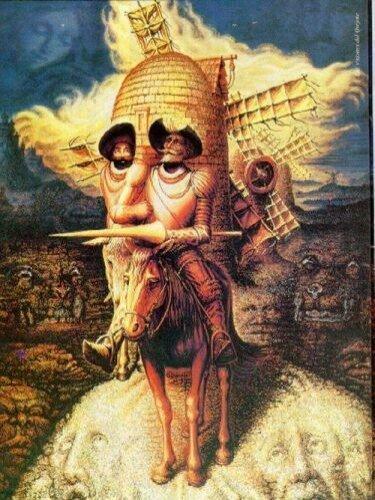 Did you miss the little figures around the mouth of the face on the right side, above Don Quixote's shoulder? 16 ohhh i feel stupid wher are they? Wow there are alot of faces. I see 20 including the horse. now 19! I think my number will grow each time I look at it. ain't that amazing just looking at faces!! i saw a women face,3 kids faces,11 man faces, a dog face, a black sea horse,23 scary faces (they're seems like monster & one of them is a women with short hair), 2 horses. Totaled 42 overall..
Omg!I think there is 11.